Since 1996, I've spent roughly 10 years off and on working as an independent promoter or talent buying in the Des Moines area. Mostly at the 2307 University Ave location. Though I have co-promoted shows in Omaha and Sioux City and done shows at other venues. During this I've worked as an independent promoter under the business name of Axiom Promotions and a talent buyer at Safari Nite Club, Hairy Mary's and currently Lefty's Live Music. I have promoted and run will over a thousand show and just about every music genre though I specialized in Punk, Ska and Metal. I've worked with bands on every level from the small local DIY band to the huge signed national act. 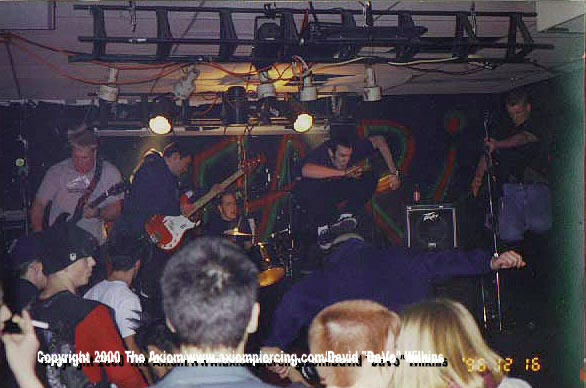 Over the years I was the first to bring a number of established and up and coming bands to Des Moines and often Iowa. My approach to booking has always been from that of a music fan. If I feel that the band has merit than they should be given the space to connect with an audience. Ideally I would rather book an event than just another show and try to build my bills to reflect that. I feel that building relationships with bands is more important than the bottom line. Sometimes that means playing the room to lower turn out a number of times before the act hits. Other times it just takes that right support slot and I'm willing to go out of my way to find that slot for the right band. Part of what I feel is important part of the relationship between talent buyers and talent, is that of a mentor of shorts. Over the years, I've done my own small part to give advice, support and friendship to countless bands. Also I've helped many first time promoters through their first show. Teaching them everything from how to structure a deal to running the show itself. It's part of my DIY background to share my experience with those that can benefit from it. Let's face it the better you are at what you are doing, the more successful the shows. I also feel honest and straight forward negotiation and clear booking keeping is the only way to do business. Offers to me are a budget and at the end of the night, I always adjust the back end to reflect it. Also I refused to be involved in Pay to Play or focusing locals to sell tickets to get on the "good show". Instead I put locals on national bills because they have a draw, are musically exciting and willing to go that extra mile to make sure the show is successful. Currently I'm only buying for Lefty's Live Music. In the past, I have worked with other venues and promoters and under the right situation, I'm more than willing to consider it. Under my contract with Lefty's, they do have first right of refusal on any event that I'm offered within a 100 miles. To help develop local, regional and national talent, I've started two series. The first is New Music Monday which is a free showcase for anyone that wishes to play. It is handled the same way as any other show except we do not charge cover or pay talent. The other one called Sinners and Songwriters and is also a free showcase but only monthly and focuses on Singer and Songwriters and acoustic acts. Held the second Sunday of each month. If you would like to play one, please contact me. If you are in a band or represent a band that is seeking a date in Des Moines, e-mail is always best. You should include target dates, links to social media and other sites and most importantly links to music. If you are a booking agent or a band seeking a date in Des Moines, here is some information about DaVo and Lefty's Live Music.